How good is the first season of the I Feel Bad TV show on NBC? As we all know, the Nielsen ratings typically play a big role in determining whether a TV show like I Feel Bad is cancelled or renewed for season two. Unfortunately, most of us do not live in Nielsen households. Because many viewers feel frustration when their viewing habits and opinions aren’t considered, we’d like to offer you the chance to rate all of the first season episodes of I Feel Bad below. 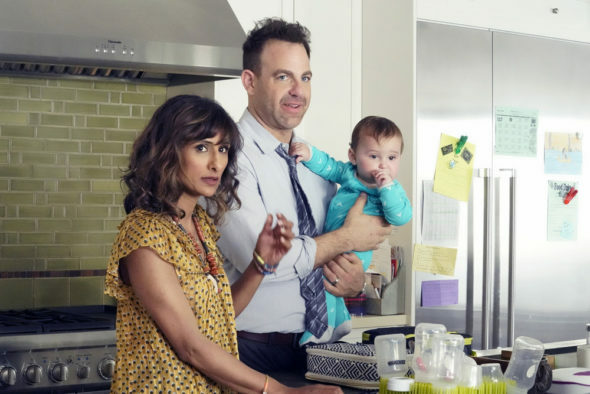 An NBC sitcom, I Feel Bad stars Sarayu Blue, Paul Adelstein, Madhur Jaffrey, Brian George, James Buckley, Zach Cherry, Johnny Pemberton, and Aisling Bea. The sitcom centers on Emet Kamala-Sweetzer (Blue), the head artist at a video game company and a married mother of three. Although Emet feels pressure to be perfect at everything in her life, like the rest of us, she’s just muddling through. Consequently, she can’t stop feeling guilty about any number of things and knows all too well her shortcomings as a wife, mother, and professional. She may not know what she’ll bad about next, but she always knows it’s just around the corner. What do you think? Which season one episodes of the I Feel Bad TV series do you rate as wonderful, terrible, or somewhere between? Should NBC cancel or renew I Feel Bad for a second season? Don’t forget to vote, and share your thoughts, below. More about: I Feel Bad, I Feel Bad: canceled or renewed? We need more comedy=life events shows like ‘I Feel Bad’ that gets laughs without foul language and lots of bare skin as so many have to use. I miss the fun, and was worried after several weeks it never appeared after the holidays. Please say its just making more shows to finish this season, and will be here for several years? I absolutely love this show. Please do not cancel. Our family has such a great time watching this show together. It is so funny and entertaining. I haven’t enjoyed a show this much in a while. This show is exactly what is gong on in my life and I’m so happy to have a show that expresses my hopes, my fears, my ambitions to be a good mom and how to find a balance doing it all while trying to keep my sanity!!!! Kudos to this show…. I certainly hope NBC renews “I Feel Bad.” Really enjoy the daughter Lily’s weekly performance and especially the pilot in which she showed her great dancing ability. Also enjoy the relationship challenges Lily and her mom in the show have. Seems very realistic. Like a lot of mother/daughter relationships! A definite keeper, funny and relatable! Also, the scene where the daughter gets a helicopter tangled in her hair was hilarious! Funny show. I can relate. Keep it!! Please renew! The show is very funny! NBC Please Renew “I Feel Bad” as a Busy Mom I LOVE this show, I totally relate & Laugh outloud! This show is my weekly treat! This is one of the best shows released this year as well as one of the best shows EVER!!! !I think if anything, the show was released at the wrong time of year. maybe it should have been released in the summer. Nothing wrong with the cast, writing, the stories, everything else is AWESOME!!! I hope it won’t end like the few other good shows that have been released. Not everyone wants to have the choice between only cop shows, medical shows and…well, that’s all the choices. Please leave the comedies alone. This show STINKS. Hopefully it will be cancelled soon.